ᐋᐸᐦᑎᔦᐤ᙮ waapahtiyeu. S/he shows him/her something. ᒫᑎᔑᒧᐧᐁᐤ᙮ maatishimuweu. S/he cuts it for him. Some transitive verbs that involve giving to another or doing something for another actually have three roles: an actor and two goals. Such verbs are called double goals. In the verb ᐧᐋᐸᐦᑎᔦᐤ᙮ waapahtiyeu. there is the canoe, John, and Louise. The focus is on John the animate recipient or beneficiary of the action. 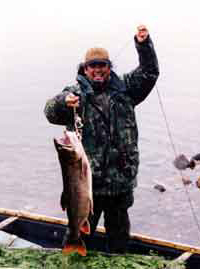 ᐧᒑᓐᐦ ᐧᐋᐸᐦᑎᔦᐤ ᓘᐄᔅ ᐅᑑᑦ᙮ John waapahtiyeu Louise utuut. Louise shows her canoe to John. The other goal of the verb can be animate or inanimate. ᒋᐧᐋᐸᐦᑎᔨᑎᓐ ᓂᑑᑦ᙮ chiwaapahtiyitin nituut. I show you my canoe. ᒋᐧᐋᐸᐦᑎᔨᑎᓐ ᓂᑕᐧᐋᔒᒻ᙮ chiwaapahtiyitin nitawaashiim. I show you my child. ᒪᓯᓇᐦᐄᑲᓂᔫ ᒦᔦᐤ᙮ masinahiikaniyuu miiyeu. s/he gives him/her a book. ᐁᓪᓰ ᒌᐧᐁᒦᔦᐤ ᒪᓯᓇᐦᐄᓂᔫ ᓗᓰᐦ᙮ Elsie chiiwe miiyeu masinihiikaniyuu Lucih. Elsie is returning the book to Luci. Verbs like ᒫᑎᔑᒧᐧᐁᐤ maatishimuweu are TA verbs derived by insertion of a -uw suffix after a TI verb ( ᒫᑎᔑᒻ maatishim ‘she cuts it’). They focus on the person who benefits from what happens (the beneficiary), and they can take animate or inanimate goals, in addition to this beneficiary goal. Such verbs are sometimes called benefactive or applicative verbs. ᑲᓇᐧᐁᔨᐦᑕᒧᐧᐁᐤ ᐅᑕᐧᐋᔒᒥᔫᐦ᙮ kanaweyihtamuweu utawaashiimiyuuh. S/he is looking after his children for him. ᑲᓇᐧᐁᔨᐦᑕᒨᐦ ᓂᑑᑦ᙮ kanaweyihtamuuh nituut. Look after my canoe for me! ᒋᑲ ᑲᓇᐧᐁᔨᐦᑕᒧᐧᐁᐤ ᑫᓃᐦ ᐅᑖᐹᓈᔅᒄᐦ᙮ chika kanaweyihtamuweu Kennyh utaapaanaaskuyuuh. You will look after Kenny’s sled for him. ᒋᑲ ᑲᓇᐧᐁᔨᐦᑕᒧᐧᐁᐤ ᐧᒑᓐ ᐅᑑᑕᔫ᙮ chika kanaweyihtamuweu John utuutiyuu. You will look after John’s canoe for him. Direct ᓂᒌ ᐃᑎᔕᐦᐊᒧᐧᐋᐤ᙮ Nichii itishahamuwaau. I sent it to him. ᒋᒌ ᐃᑎᔕᐦᐊᒧᐧᐃᓐ᙮ chichii itiashahamuwin. You sent it to me. Inverse ᓂᒌ ᐃᑎᔕᐦᐊᒫᒄ᙮ nichii itishahamaakw. He sent it to me. ᒋᒌ ᐃᑎᔕᐦᐊᒫᑎᓐ᙮ chichii itishahamaatin. I sent it to you. ᓃᒥᐦᐁᐤ᙮ niimiheu. S/he causes him to dance. Many verbs ending in ᐦᐁᐤ -heu have a causative meaning. They indicate that someone is making someone else do something. Causative verbs are TA verbs. They can be derived from TI or AI verbs. ᑲᔅᒉᔨᐦᑕᒻ᙮ kascheyihtam. VTI S/he is frustrated about it. ᑲᔅᒉᔨᐦᑕᒥᐦᐁᐤ᙮ kascheyihtamiheu. VTA-causative S/he causes him to be frustrated. ᓃᒨ᙮ niimuu. VAI S/he dances. ᓃᒥᐦᐁᐤ᙮ niimiheu. VTA-causative S/he causes him to dance. ᐹᐦᐴ᙮ paahpuu. VAI S/he laughs. ᐹᐦᐱᐦᐁᐤ᙮ paahpiheu. VTA-causative S/he causes him to laugh. ᒣᑕᐧᐁᐤ᙮ metaweu. VAI S/he is playing. ᒣᑕᐧᐁᐦᐁᐤ᙮ metaweheu. VTA-causative S/he makes him play. ᒨᐦᐁᐤ᙮ muuheu. VTA-causative S/he makes him/her cry. ᒫᑑ᙮ maatuu. VAI S/he cries. ᑲᔥᑲᒥᑰ᙮ kashkamikuu. It is tight and digs into him. Some VTA verbs almost always appear in the inverse with an inanimate subject. Some, like ᑲᔥᑲᒥᑰ kashkamikuu above or ᐋᓯᐦᒉᔨᐦᑕᒥᐦᐄᑰ aasihcheyihtamihiikuu below are never found in the direct. ᐲᐦᒋᑐᓀᔥᑳᑰ᙮ piihchituneshkaakuu. It flies into her mouth. ᑲᔥᑲᒥᑰ᙮ kashkamikuu. It is tight on him. ᒫᐦᑎᑯᓂᑰ᙮ maahtikunikuu. It (illness) impedes him, her. ᐋᓯᐦᒉᔨᐦᑕᒥᐦᐄᑰ᙮ aasihcheyihtamihiikuu. It interests or motivates her. ᑯᑖᐧᐄᔥᑖᑰ᙮ kutaawiishtaakuu. The porcupine quill goes deep into her skin.